We have been using these posters in our homeschool since 2012! It never occurred to me to offer them as free printables until a few weeks ago! I have had them sitting in my hard drive for about 3 years now. Oh, well. Better late than never, right? 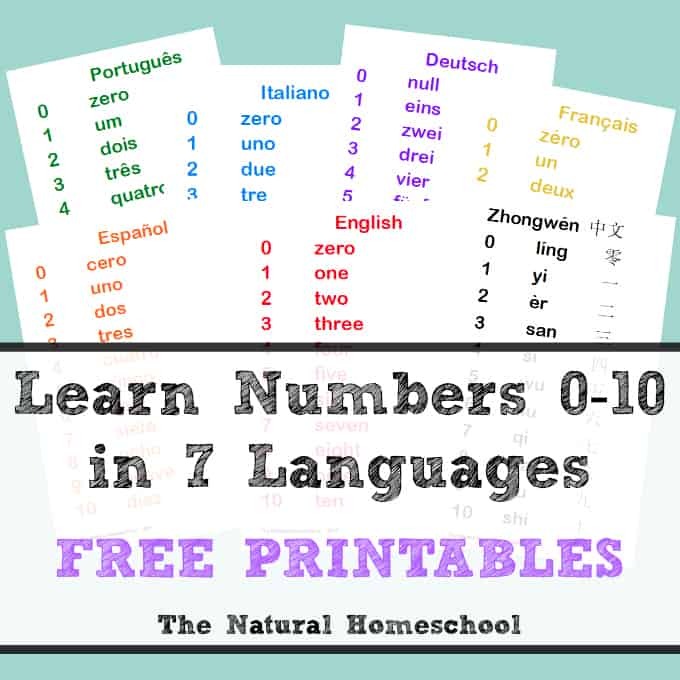 I hope you really enjoy this post and get your free Numbers (0-10) in Seven Languages printables. Are you wondering why seven languages? Well, these are some of the languages that we are learning in our homeschool. I made these charts to practice them and study them at home. I am happy to share them with you and your children! Since we laminated them, we have used double-sided tape to put them on the wall to read during Calendar Time, we have taken them down to play games, we have put them in sheet protectors to keep in a binder that they can read in their room before bed and we have even made up songs for each chart as we read them along. I wanted to include links to videos that will help you learn to pronounce the numbers in the six non-English languages. Enjoy! Here are some resources that we have used and like. And yes, I included a Sign Language DVD because we love it, even though I didn’t include an ASL chart for it. We recommend it. Enjoy these printables! We sure do daily! Let us know how you are planning on using them! Inspire us with fun ideas!